Jan. 28 is the 23rd day of the last month in 2018 Chinese lunar year, which is known as the Small Spring Festival (小年 xiǎo nián). It symbolizes the start of the Spring Festival celebrations. In the afternoon of Jan. 28, USTC international students celebrated this Small Spring Festival in the Institute of Advanced Technology together with the deputy director and staff from International College. Apart from display of various delicate Chinese traditional handicrafts, like writing brushes, ink sticks, paper-cuts, lanterns, Chinese Knots, Cloisonne items and etc., four teachers were invited to teach international students how to make paper-cuts and write Spring Festival scrolls, who have been retired from USTC but still enthusiastic about promoting cultural exchanges. Students were totally immersed in the strong atmosphere of preparation for Chinese New Year by writing spring festival scrolls, making paper cuts, and at the same time enjoying cultural stories given by the teachers. Even some foreign kids tried to use brushes to write Chinese characters. Under the guidance of teachers and after some practice, students finally made satisfactory handwriting and paper-cutting. All the Chinese characters they wrote on the scrolls expressed their good wishes for the new year to USTC and their families. It is a tradition to eat dumplings on the day of Small Spring Festival, which is also known as Kitchen God’s Day. Students were very interested in making dumplings and after learning from teachers, they can make different shapes of dumplings. 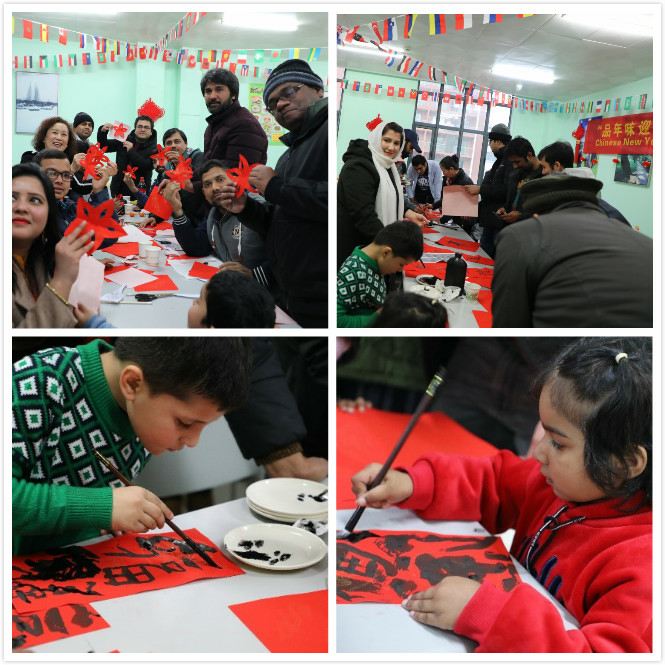 Through all the activities, students experienced the hot passion for Chinese New Year, knew more about this significant Chinese traditional festival and became much eager for tasting Chinese cuisine and learning Chinese culture. Wish all international students a pleasant and successful Year of Pig!